On December 23, 1954, Dr. Joseph Murray performed the first successful kidney transplant on Richard Hendrick at Peter Bent Brigham Hospital, in Boston, MA. 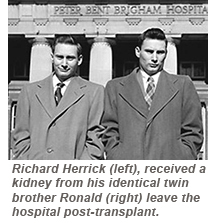 Hendrick received the "Gift of Life" from his identical twin brother, Ronald. That historical, medically ground-breaking surgery set into motion today's rather common-place practice of organ transplantation to save lives and cure disease. Dr. Judy McDonough Treichler, Ph.D.
"I was on the waiting list at LLUMC for just over 2 years. I was diagnosed with Hep C in 1995 and my biopsy showed stage 3 fibrosis at that time. It took 15 more years to develop into cirrhosis and another 3 years to develop liver cancer, hepatocellular carcinoma (HCC). My only risk factor was blood transfusions for a hereditary blood disorder. I really did exceptionally well during the last 20 years even though I had transarterialchemoembolisation (TACE) two times and proton radiation for four weeks. The devil cancer was returing the last year and I was then truly fighting for time!" Dr. Judy McDonough Treichler was born in Los Angeles, CA and graduated from Loma Linda University with a Doctor of Public Health (DrPH). She worked for many years in epidemiology for an International Healthcare Company in the Philippines, Saudi Arabia, and Mexico as well as in So. CA. Dr. Judy taught classes in nurtition, gerontology, environmental health, and foodborne illness before retiring in 2008. Since retiring, Dr. Judy joined an International Dance group and perform for many organizations and charities, an activity she clearly loves. The dance troop includes dances from China, Korea, Japan (Asian), Spain, Mexico, India, Polynesia, Hawaii, and American Tap. She enjoys dancing very much and in her words, "It's excellent exercise!" Help us eliminate the long wait for transplant.Help us make more organs available for transplant. Please make a tax-deductible donation to FAIR. Presentations by Dr. Robert Gish and Bill Remak at the 2/18 California Technology Assessment Forum Meeting discussing new Hepatitis C treatments, evidence, costs, who should be treated and how with limited resources. Dr. Gish pointed out to the committee members that "All patients should be treated." See full meeting discussion on YouTube here. Dr. Gish begins speaking at minute marker 1:30:50; Bill Remak testifies at minute marker 1:42.